You stand close to people on the “L” and on buses. Close enough to smell their cologne or perfume. Close enough to hear their thoughts. Waiting in lines with them is so common, you recycle conversations. And you make the mistake of assuming that being around people alleviates loneliness. Loneliness is not an illness cured by applying more humans. But it’s easy to see why we think that. Places like Chicago, New York and Los Angeles are full of people experiencing the placebo effect of proximity. In the story I read about the woman who moved from New York to Portland only to experience the worst loneliness of her life, she talks about making a significant connection with another human being as being necessary to the process of fixing loneliness. Perhaps this is why live storytelling events like The Moth are becoming some of the most popular activities in cities like Chicago and Los Angeles. Hearing someone else’s story in an intimate setting with drinks in our hands is a salve for that lonely region of the heart that just needs to understand that it’s not an anomaly. Shared experiences are the driving educational forces that break down our differences and allow us to feel connected to what we otherwise do not understand. There is a deep power in hearing those points of similarity in someone’s story, and gifted storytellers know how to evoke the strongest sympathies, because they play up scenarios that reflect our most intense connections or disconnections. We’re getting close to a decade since social media took over our lives, but we were lonely long before Facebook and Twitter became our substitute for human interaction. Long ago, even as far back as my own childhood, we relied on one another to fill those needy places in our souls. Even more, we relied on each other for food, shelter and entertainment. Today everything is available at the touch of the button. Need human touch? You can buy a hug. Need entertainment? Instantly stream whatever you want to watch. We don’t even have to ask each other what we want to watch anymore, because Netflix can use data to determine what we’ll most likely enjoy watching. Don’t get me wrong, I love the advances we’ve made in my 41 years here. The future is spectacular with possibility. And loneliness is not new to this era. It’s as old as our species is. But there is a special danger of advancing this quickly without examining our humanity. A danger of losing a generation or two before we find our moral compass, our center, our humanity. We understand that wellness is built on balance and moderation, and yet we’re trading away the slower tried and true for efficiency and speed. Science, blessed science, has given us the keys to unlock the universe, and yet we’re cursed with an inability to see beyond the horizon. Of course we keep pushing the horizon forward, but we cannot see the big picture, so we live in the space between what we know and what we cannot know, and wonder whether or not it’s good for us. Medicine can make us happy. But it cannot fix sadness. Technology can fulfill our wants. But it cannot supply our needs. 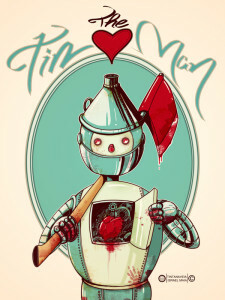 And so we’re the Tin Man seeking a heart. A beat to cling to. An 800 million year old organ to ground us. And not just the heart as a physical machine. The heart as the metaphysical home of empathy. Loneliness is a byproduct of being human. Its cure cannot be outsourced to non-human solutions, nor can its cure be implanted from non-human sources. When we strip away the technology we’ve applied to ourselves, the layers of tin we’ve been applying since the industrial revolution and likely beyond that, we’ll find something amazing in these empty kettles. We’ll find we already have a heart.